There are a lot of lessons one might take away from the D-Day landings 70 years ago today. In a time when ugly nationalism is once again on the rise, the one I’d like to bring home is that the defeat of Fascism was a team effort. We know well the roles of British and American soldiers, sailors, and airmen. In recent years the Canadians have finally been getting their due for Juno Beach. It goes beyond that though. There were Dutch, Belgian, Polish, and Norwegian sailors in the Channel; Czech, Polish and Norwegian pilots flying support missions; and French commandos and partisans on the ground. Two months later, when the German army was on the run, it was tankers of the Polish 1st Armoured Division who closed the Falaise Gap. And of course none of this would have been possible if the Soviets had not torn the guts out of German armed forces in three years of savage fighting on the Eastern Front. We would do well this day not to honor just the dead of our own nation, but all those who died to end fascism. One of the few local places that sold gaming stuff circa 1980 was a mall bookstore called Lauriat’s. They had D&D and Traveller books, and a small selection of Grenadier and Heritage miniatures. I had started playing D&D at age 10 and I would go browse that section whenever my family went to the mall. I had little money, so I mostly just looked. After my birthday or Xmas, I could usually splurge and get something. Deciding what to buyu was difficult. I could not pop on Google and find reviews. If there were gaming fanzines in Massachusetts at the time, I never saw one. I was left to judge by flipping through the books…and looking at the art. 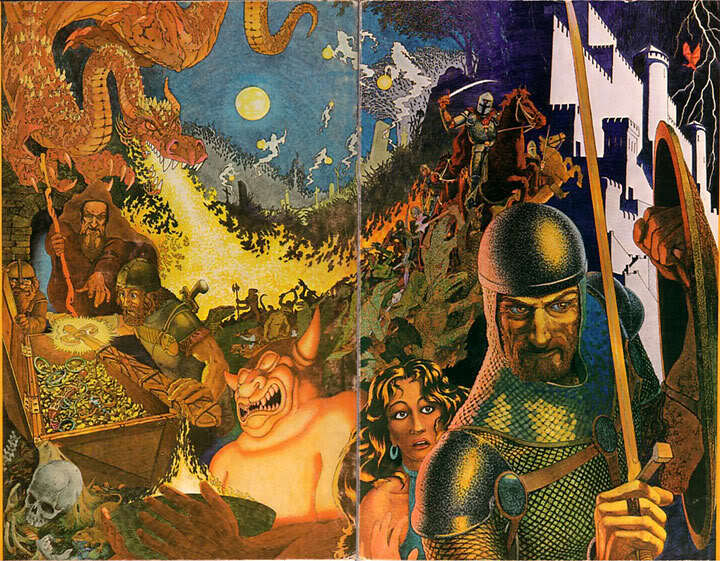 And one cover piece always drew my eye: module T1 The Village of Hommlet. I came back to this image time and again. It was such a great evocation of D&D: a crazy monster to fight, an evil cult to smash, and the mysterious ruined moathouse to explore. When I finally scraped together $5, I bought that module and it was largely because of the cover art. It was the first time I noticed the initials DAT on a piece of D&D art but certainly not the last. 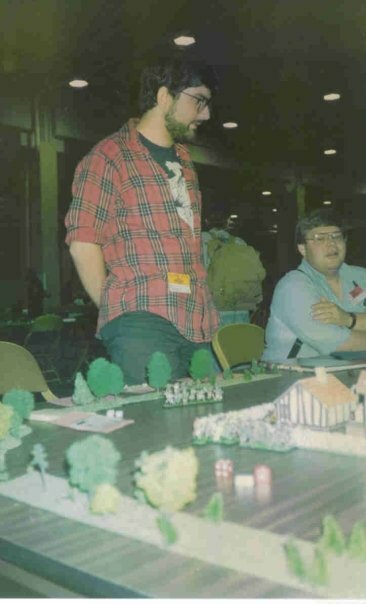 DAT was Dave A Trampier, one of the great artists of D&D publisher TSR. 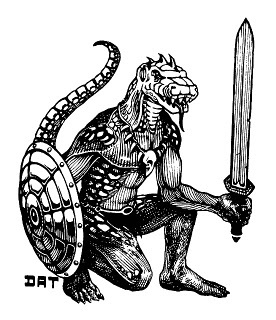 You may not have known his name but if you played the game in the early 80s, you knew his work: the iconic cover of the AD&D Player’s Handbook, the beautiful GM Screen panorama, the classic monster illustrations like the lizardman and fire giant, and of course Emirikol the Chaotic in the DMG. Tramp’s story was a strange one. After doing all that amazing work, he disappeared from the game industry and from the world of illustration in the late 80s. No one knew what had become of him for years. About a decade ago he was discovered driving a cab. Yesterday, he passed away. I don’t know why such a great artist left a promising career behind. Rumor has it he was bitter about the way TSR treated him. It’s a shame he stopped doing art altogether. It’s tragic that he never had his second act, as many of us hoped he would. I do hope that before his passing, he had some understanding of the impact of his work on a generation of gamers and dreamers. 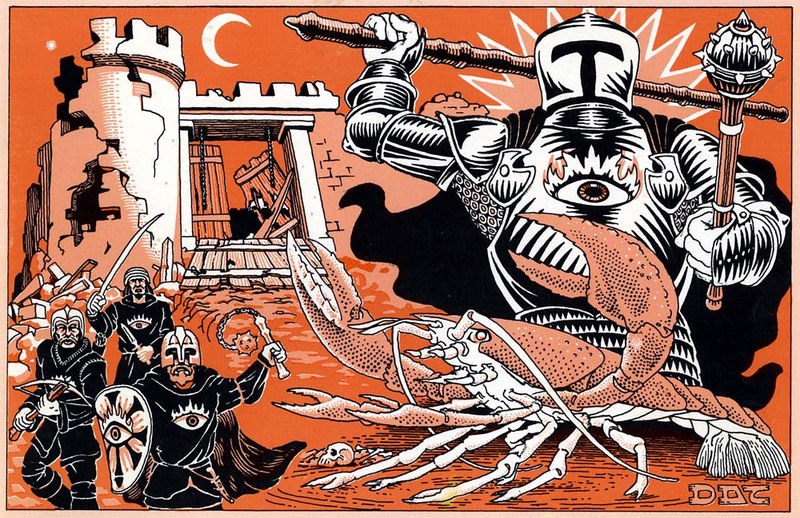 For many of us, our careers as creators began with D&D and the inspiration we drew from it. The game, the ideas, and the art set our imaginations on fire. Dave Trampier was a big part of that and gaming is poorer for his lost. Thanks for everything you did, Dave. You will not be forgotten.